As promised, here is the recipe for Chinese grilled lamb , which I made for yesterday’s friends gathering. 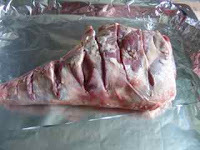 A few friends have been asking already for some time how I prepare the lamb . Normally for small gatherings, I only make a few lamb chops or leg fillet; however, this time was one of those big gatherings where everyone would bring some food, (the host already prepared a lot), and I decided to prepare a medium size lamb leg . In Xinjiang province, the majority of the population belongs to the Weiwu’er ethnic group , and lamb dishes are their speciality. I already mentioned that lamb is very important in the custom of Weiwu’er or Hui ethnic groups . For example, if you walk down the street in my city in the evening, there are many small stalls selling grilled lamb on a stick , and most of the sellers are from Xinjiang. Lamb has become a very popular dish in the whole of China because of their influence. In fact, here is a popular chain of Islamic restaurants called “one cow” (although their specialty is to prepare a whole small lamb for their customers). However, home grilled lamb leg in Northeast China is not common, mainly (probably) because Chinese home kitchens are traditionally not equipped with built in oven and grill, and selling a whole lamb leg is also not a common thing in the markets or butchers. Also, in Xinjiang the lamb is grilled directly over the fire flame!! I am very glad that I learnt this way of cooking lamb, I often use the similar method to cook lamb pieces, chops, fillet, mince balls, etc. It is very different to usual Chinese stir frying or lamb in soup , but it is quite easy to make, and the time for preparation is very convenient, after that, it can just be left in the oven, then you can get on with making other dishes — so it is definitely a dish recommended for having guests and you having to cook quite a few dishes — it is very presentable , tasty, and time saving. 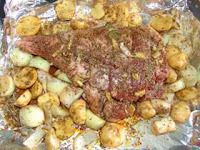 I think in some Western countries lamb legs are also grilled with potatoes and onions. However, the seasonings are very different. I don’t really cook it often, almost forgot all the details of the recipe, but the main thing I did not forget, well, it is a very necessary ingredient, is cumin seeds . Most of the famous Chinese lamb dishes are with cumin. Others, I just followed my instinct. :) Hope my friends liked it yesterday. I think there are only two things you need to pay attention to: one is the seasonings, the other one is the grilling time. If you are in China, in most of the supermarkets, you can get ready-to-use grill seasonings. The most popular brand is “Wang shou yi” – a Islamic recipe seasoning which mainly consists of ground cumin, dried chilli, salt, sugar. Sometime, I would bring some back, but most of the time, I have to make it up myself. 1) Slice the surface of lamb leg, “making some cuts”, so the seasonings could go in easily. 2) Cut potato and onions into cubes. 3) Chop a good piece of ginger and 2 spring onions into small pieces. 4) Evenly spread chopped ginger and spring onion, around 6 -8 tablespoons of oil, 1 tablespoon of ground cumin, probably 1/2 tablespoon of ground ginger, 3 (or more) tablespoons of cumin seeds, 2 tablespoon of salt, 2 tablespoons of light soy sauce, 2 tablespoons of white sugar, 1 tablespoon of ground chilli, a few drops (only) of rice vinegar, and around 3 tablespoons of sesame oil on the lamb leg, make sure both sides have plenty of seasonings. 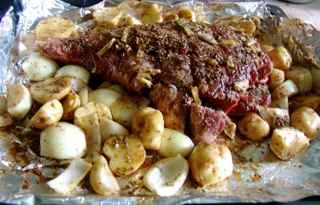 5) Put chopped potato and onions in the tray, and mix well with the same seasonings. 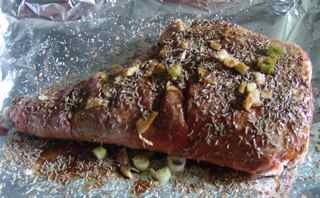 6) Leave the seasoned lamb leg for couple of hours (or longer). 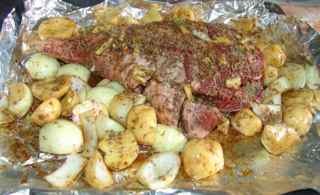 Place the lamb leg tray into the oven, and set oven at 150 degrees, for 40 minutes, then lower down to 100 for further 1 hour. ( I use electric oven) Sometimes, if I am in rush, I just set the oven to 200 degrees for 45 minutes, it is still good, but the very inner layer could have less taste. It is good to go with beer or wine of your choice. As for stable food, well, I guess lamb can really fill your stomach up, but if you like, with yesterday’s recipe raising flour bread (fa mian bing) is also not a bad combination.